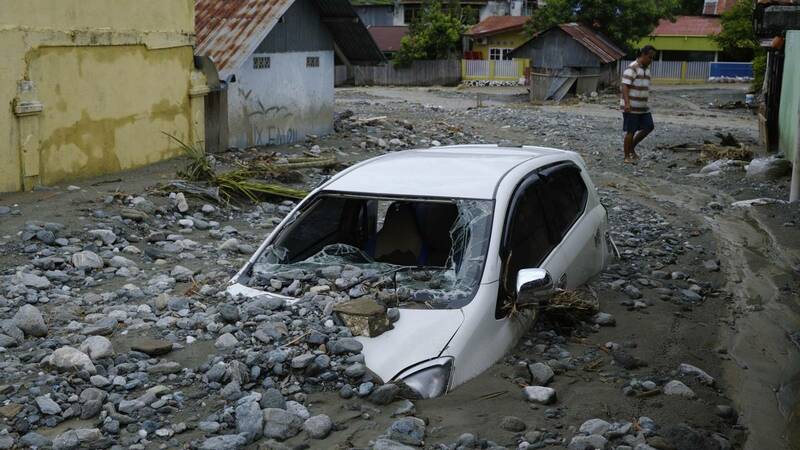 A car sits abandoned in the mud on a flooded street on March 20, 2019, in Sentani, Papua province, Indonesia. (CNN) - The Indonesian Red Cross is continuing search and rescue efforts in the wake of devastating floods that killed at least 113 people in the eastern province of Papua, with almost 100 still missing more than a week after the disaster struck. More than 11,500 people were displaced in flash floods and a subsequent landslide in the Sentani area of the provincial capital, Jayapura, earlier this month. As many as 94 people remain missing, according to state media TVRI, and a state of emergency will remain in place until Friday. Indonesian Search and Rescue teams (TIMSAR) are still searching the affected area for survivors, according to Christa Stefanie, a spokeswoman from Tangan Pengharapan, an Indonesian social enterprise. Continued heavy rains have increased the likelihood of another flash flood, she said, adding that the conditions have slowed the search for the remaining missing people. "The landslides caused by this flash flood covered the entire area with mud. This greatly slows down the searching process, especially since the government avoids using heavy machinery in some areas in fear of injuring the survivors." At a coordination meeting held over the weekend, Indonesian Red Cross (PMI) head Sunarbowo Sandi told local media that workers were focused on "efforts to speed up handling and support for the rescue operations by the PMI during the emergency response period." Rosemarie North, of the International Red Cross, told CNN that aid workers have been distributing baby kits, buckets, tarpaulins and kitchen supplies. Volunteers are also helping dig and maintain latrines for displaced people, she added. Stefanie, the Tangan Pengharapan official, added that clothing, food and other essentials are being donated by other organizations. Some areas of Papua province received more than 18 inches (450 millimeters) of rain over three three days. However authorities could not reach some of the hardest-hit areas because of downed trees, damaged roads and detritus blocking their paths. The Papua provincial government has pledged to relocate residents living in the Cycloop mountains region, where deforestation was identified as the main reason for the floods. The province's deputy governor, Klemen Tinal, said that the government had asked residents to stop logging activities in the Cycloop nature reserve area, according to CNN affiliate CNN Indonesia. "People should be aware that in the future they will not carry out activities in the Cycloop area. Flash floods cannot be considered ordinary," he said.